Aren’t the jerseys on these three enough to like the set as a whole? The original Raptors jerseys are great, and seeing ‘Bullets’ on a jersey makes me miss watching Webber and Howard try to make Washington a winner. Design-wise, what’s not to love? The scans look just as great as the cards do in person. Looking at the scan, it kind of reminds me of the new Panini Revolution product that was just released, minus the stars. This set has a great checklist, with all the major rookies from the class of 1996-97. Kobe, Iverson, Marbury, Ray Allen, they all make an appearance in this set. The only rookie shown here is Camby. I like that this set is affordable based on being inserted at a reasonable 1:9 packs. Of if only I could bust packs from E-X2000 today. What a blast that would be. Baseball card land is going crazy over 2017 Topps Series 1 release. And while I’ll probably pick up a blaster or loose packs myself, I am just as excited over a lot of former Pacers I picked up in the last week. I recently came across my favorite type of ebay seller: One that offers free shipping and discounts with a certain number of auctions won, and one that has thousands and thousands of listings. I could browse those listings all day. I settled on an initial batch and in a few days they arrived! And here you have it, my first lot of basketball cards purchased in five years. I’m so excited about this lot of cards that I’m going to give some cards away. See the contest at the bottom of the post. I’m pleased that Panini is releasing new cards of the Dunking Dutchman, Rik Smits. Anytime I see new Pacer cards of players from the 90s teams that had so many deep playoff runs, I get excited. While I still find new 90s cards of these guys, I’ve seen most of them, so it’s great to see new-to-me cards. This Smits fits the bill, and it’s #’d out of 199. The Croshere is one of those new-to-me 90s cards. Is there an insert set that screams 90s more than this one? Some awesome insert sets were in NBA Hoops packs at the time at an affordable price point. I’m going to look to pick up the Duncan from this set for sure. Croshere landed a nice contract after his great playoff performances in Indiana’s run to the NBA finals in 2000. That season and the following one were his best statistically for his career. He spent most of his career with the Pacers, finishing his career after 12 seasons. He now does radio for the Pacers, mainly road games when the legendary Slick Leonard is not available. Foster is one of my top 5 favorite Pacers ever (Reggie Miller, Danny Granger, Rik Smits and Jermaine O’Neal are the others). He was the ultimate professional, doing whatever he was asked, even though he never had any plays run for him. That wasn’t his game. He was relentless in pursuing rebounds. Whether he started (which he did quite a bit) or came off the bench, you always knew what you were getting when Jeff came in the game. I also appreciate that he spent his entire career with the Pacers. One fun fact about Foster’s career: He is 4th all-time in career offensive rebounding percentage. He led the lead in this stat category twice during his career. On the cards…can’t beat a cheap rookie refractor. These are the only cards that I may already have in my collection. Unfortunately I don’t have my inventory documented like I should, especially after a 4+ year break. Two Prizm Prizms, whatever that means. I guess it means shiny. Jackson’s signature floater in the card on the left, and against the Knicks makes this card even better. Love the flo-jo jersey in the 2014-15 card. Can’t beat these two. I do like how the 2014-15 cards have game photos. That seems to have been taken away in more recent Prizm releases. At one point Mark Jackson was 2nd all-time in NBA history in assists. He’s dropped to 4th, passed by Steve Nash and Jason Kidd. Still impressive and somebody you might not think of when you think of all-time NBA assist leaders. Again, a new card for my collection, hopefully. The insert set looks familiar so I am not liking my odds, but I couldn’t pass up the potential for a new Miller insert on the cheap. Reggie was a world class shooter, that’s for sure. To me this is the gem of this group, which is why I have it last. Power Boosters were inserted 1 in 36 packs, which makes this a semi-rare pick up. This one is from series 2. Sadly this is the only Pacer player with a Power Booster parallel. Maybe I’m easy to please but for a dollar I was thrilled to get this one. It scanned great too which I was worried about. This Richaun Holmes autograph from 2015-16 NBA Hoops. I will also try to send a handful of cards of your favorite team. Enter by end of the day, Saturday February 11th, 11:59 pm eastern. So there it is, the first contest since Hoops Hobby’s return to the blogosphere. I started going out of my way to add George Hill cards to my collection during his last season in San Antonio. I just liked his game. He fit right in with the crisp, fast ball movement that the Spurs still deploy on opponents. He’s got a great 3-point shot and driving floater and plays good perimeter defense. Like a lot of NBA fans, I play (or used to play) a lot of NBA 2K games on the playstation. One of my challenges was to turn around the struggling Bobcats. In the game I was able to trade for George Hill. It’s funny how things like video games can turn you into a fan of certain players. One game I made it my mission to score 50 points with Hill, and I succeeded. Anyway, that summer George Hill was traded on draft night to the Pacers for Kawhi Leonard. I don’t think the Pacers had any intention of drafting and holding onto Leonard, so I don’t feel too bad as a Pacers fan about the outcome of the trade. And George Hill became a key piece of several Pacers deep playoff runs. This past summer the Pacers traded Hill to the Jazz in a 3-team deal, getting back Jeff Teague. I understand the Pacers got younger with the trade and are making an effort to play more up-tempo, which Teague fits into. But by gosh I miss George Hill’s game! And Hill is having a career best season with the Jazz. I couldn’t be happier for him and the Jazz got a great piece which will help them make yet another deep playoff run for George Hill. My George Hill collection is not anywhere close to my group of Duncan cards, but I do have a few autos which I am lacking with Duncan. Hill has a nice, readable signature. Out of IUPUI in Indianapolis, Hill was the hometown hero for the Pacers. This card points out him being the only Jaguar to be selected in the NBA draft. Another rookie card of Hill, it’s hard to leave a Topps Chrome rookie off the list. The quote from IUPUI’s coach says it all about George Hill. Just a class act and the perfect 6th man and sub for Tony Parker. This one makes the list because I pulled it out of a box of Season Update myself! Can’t go wrong with pulling an autograph of one of your favorite players! This card was from his last year in San Antonio. Timeless Treasures for 2010-11 was a single pack containing 5 cards, with an SRP of $100/pack. A card this rare from a high-end product like that is good enough to make my list. Believe it or not, this is the only card I have of George Hill in a Pacers uniform. Remember I pretty much stopped collecting in 2012, picking up baseball cards in 2014, and I am just now getting back into the basketball card scene this year. I certainly have many holes to fill in my George Hill collection, but this group of cards is a good start. Watching the Jazz destroy the Pacers the other night fairly easily, I couldn’t help but feel great for Hill, who scored 30 points against his old team. I’ll be pulling for the Jazz to come out of the Western Conference this year. Way to go GHill3. Tim Duncan is my favorite non-Pacer of all time, and probably my second favorite player behind Reggie Miller. It’s weird not being able to watch Duncan play this season. In my book he goes down as the greatest power forward in the history of the game. So much has already been said about Duncan, so I will get down to the cards. These aren’t necessarily the most valuable cards in my collection, although some of them may fall into that space. They are just my favorites. They break down into four categories. I’m starting the list by breaking the rules with counting two cards as one, but I just couldn’t choose one over the other and I wanted nine other spots. Try to find cooler base sets than these two. This certainly was a great year for basketball cards, wasn’t it? I remember opening a few packs of these and pulling a Patrick Ewing. Even though he was on the hated Knicks I was still in love with the card and design. I probably don’t have that card anymore but it sure was a thrill for an 11 year old to open packs of this stuff. 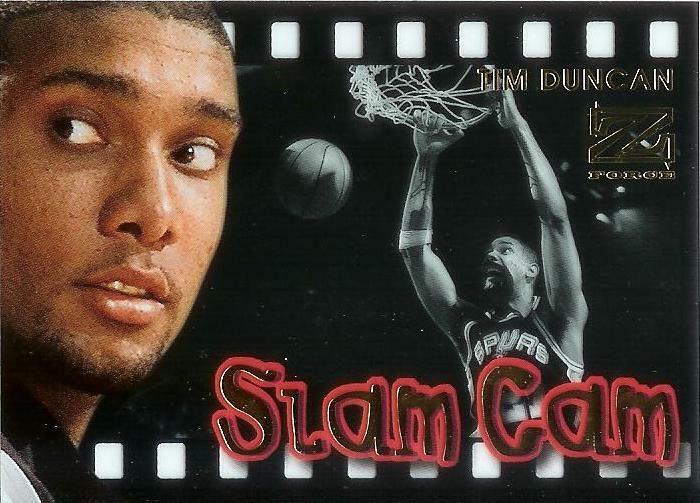 The most recognizable of Duncan’s rookie cards, along with probably his SP Authentic rookie. While I never added a refractor version to my collection, his Chrome rookie has to fit somewhere in my top 10. The back of this one asks what makes a star. Is it scoring? Rebounding? Defense? Consistency? Heart? Duncan has all of these. A good quote too from Dave Odom, Duncan’s coach at Wake Forest on the back. Duncan throwing down a jam with future teammate and current Warriors coach Steve Kerr watching. Part of what makes this a cool card is it was the first year with the full SP Authentic named set. The previous year obviously had a great rookie class and some key rookie cards in the SP set with Kobe being the top card, but 1997-98 was the first SP Authentic set. This set the stage for 1998-99 which I remember as being a hot set with Vince Carter’s rookie being the most sought after at the time. Looks like the modern Court Kings sets. Just always liked the look of this set and Duncan going for the lay-in makes for a great card. Always blows my mind that the Spurs landed Duncan in the first place because of Robinson’s injury. Don’t have a great reason for picking this except he is sitting on a throne of basketballs! What a design for an insert set. This one has to rate up there in terms of value. I’m fairly sure one of my friends traded it to me in the early 2000s and I’m sure I got the best of whatever trade we made. I’m trying to reacquaint myself with the basketball card hobby, and what I’m noticing is if the insert set was redone in the Upper Deck Retro set, then the original set is probably pretty highly sought after these days. 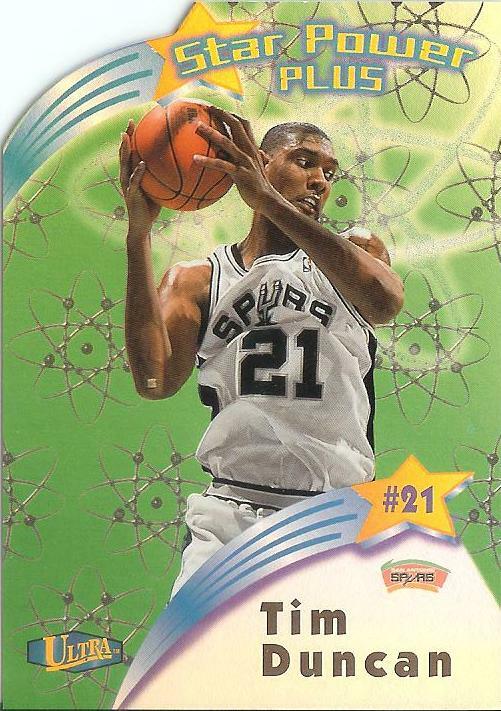 This is the first insert I pulled of Duncan from a pack, and I’ve held onto it for a long time. For this reason alone it makes the list. It’s also an interesting design that hasn’t been close to replicated, with a shiny pick background of water, rocky shorelines, and sky. I can’t put enough Team USA cards into my collection. In fact there are some insert sets I’d like to put together from some other sets around this time focused on Team USA. One is an insert set from Fleer Avant, if I remember right. I picked this up right before I closed up shop on the blog in 2012, but it still cracks my top 10. Hard to go wrong putting a Beam Team insert into a top 10 list. Add a relic to the mix and it was hard to omit this one from this post. It’s a plain black swatch but it doesn’t bother me. So there you have it. Notice no autographs in this list. Haven’t added one of those to my collection yet, but would like to if the price is right. I plan to share more of my Duncan collection in future posts, and I need to get a wantlist up. Don’t have most of his newer cards and want to see which inserts from the 1990s and early 2000s I am missing. 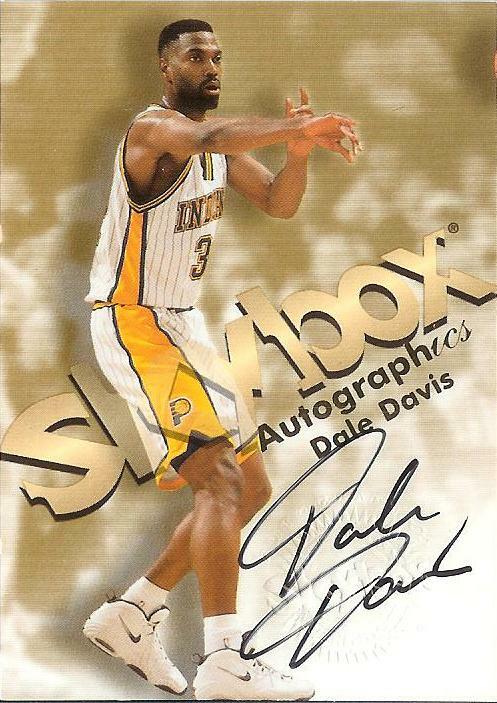 I’ve picked up where I left off, with the first pickup in my return to basketball card collecting being an addition to my Indiana Pacers autograph collection. The goal here is to get an autograph of every player to appear in a regular season game for the Pacers, preferably on a card in a Pacers uniform, if possible. I’m going to be sharing my progress so far over a series of posts, but my most recent pickup is an autograph card from 2013-14 Panini Totally Certified Basketball of Herb Williams. This is player number 79 I’ve added to the Pacers autograph collection. Herb recorded his best statistical seasons as a Pacer, averaging a career best 19.9 points per game in the 1985-86 season. The team finished 26-56 that year, though. Herb got his first taste of the playoffs with the Pacers in 1987, starting four games as the Pacers lost to the Atlanta Hawks 3-1. He played 57 career playoff games, most with the Knicks, and many of those in key series against the Pacers. He played until he was 41 years old, retiring after an impressive 18 year NBA career. He served as an assistant coach with the Knicks and served as head coach for 39 games during the 2004-05 season after Lenny Wilkins resigned. Glad to add this auto of Herb Williams to my Pacers autograph collection. The card looks better in person than in the scan. It is a sticker auto and I may look to add an on-card auto down the line. I’m not aware of a certified autograph with Herb in a Pacers uniform that isn’t a sticker, though. Hello to the blogosphere. When I started this blog back in the summer of 2011, it was because I noticed a void of basketball card blogs in the hobby and wanted to show some of my collection and talk about the hobby I’ve been a part of since I was a child. Now I am thirty years old with a baby boy, hoping I can pass to him a love of basketball, and with that a way to enjoy the sport more, and something we can share. I was excited to interact with other collectors, get their opinions and discover parts of the hobby I had missed or overlooked. A few other basketball card blogs came and went, and my site grew over the years it was active. But I noticed the baseball card portion of the blogosphere was infinitely larger and more active. And so in 2014 after a 2 year hiatus, I started a baseball card blog, Card Stacks Blog, and started to follow MLB more and pick up Atlanta Braves cards and a few other players. I certainly don’t plan to completely abandon that blog and will post there when the urge strikes me. I found that sports card bloggers are incredibly generous and are eager to interact and exchange cards. I am hoping that there is an audience for a basketball card blog. It may not have as many box breaks as it did when I had more disposable income, but I will open the occasional loose pack and continue to share cards from my collection. I also hope to send cards that don’t fit into my collection to other collectors, and add some recent Pacers. I’m less of a ‘hit’ collector these days, but I won’t turn them away and I am still looking to add autographs of Pacer players. I have 0 cards of Myles Turner who looks to be a superstar in the making. Paul George has also become a superstar over the past several years. The NBA as a whole has changed a lot and I hope to add some league commentary as well. I can’t make a post without showing some cards, of course. Last year I opened a blaster of 2015-16 Hoops for the purpose of giving cards to kids on a youth basketball team I coached. I kept a couple of Pacers. The only guy still on the team is Stuckey. Budinger and Sloan have moved on. In fact, the Sloan is actually a Nets card. For a third string point guard, Sloan was a bargain for what he brought to the team. I also pulled an autograph. Holmes is a second round pick in the 2015 draft out of Bowling Green. He’s received some decent minutes with the 76ers and also spent some time in the Developmental League this season. Would like to send this to a 76ers collector. It looks like there’s some hope for fans with this team with Embiid looking like a star. I’m excited to update this blog again. 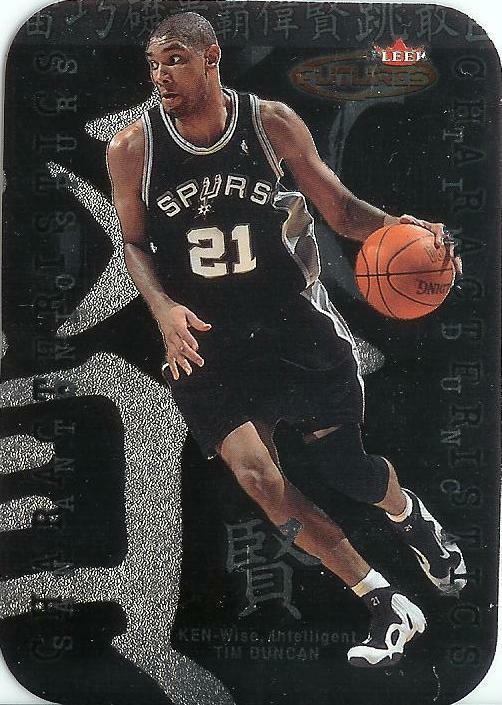 Are there any basketball card collectors out there in the blogosphere? Since I started collecting back in the mid-90s, my focus has always been on collecting ‘any and all Indiana Pacers cards, past or present’. 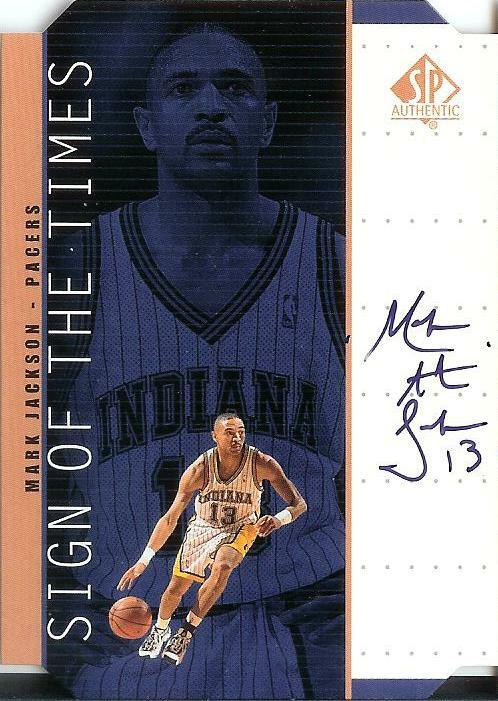 The mid-to-late 90s Pacers will always hold a special place in my heart and in my basketball card collection. Guys like Mark Jackson, Rik Smits, Jalen Rose, Dale and Antonio Davis, and of course the great Reggie Miller are my favorite players of all-time, and I doubt that will ever change. After that era of Pacer basketball, players like Jermaine O’Neal, Jamaal Tinsley, Ron Artest, Al Harrington, Stephen Jackson, Mike Dunleavy, Troy Murphy, along with lesser-knowns, have come and gone. While exciting to watch, now that these players have moved on, I can’t say I go and regularly look through my collections of these guys like I do the cards of Pacers from the 90s. How this impacts my collecting habits today? Well instead of collecting any and all Pacers, I’ve found myself shifting my focus to other favorite players not wearing a Pacer uniform, along with the key guys on the current team (currently Danny Granger, Paul George, Roy Hibbert, etc…). And so my Tim Duncan collection has taken off, I’ve added autographs of other greats such as Tony Parker and Paul Pierce to my collection, and I’ve put together small collections of Kevin Durant and Grant Hill. I’m pleased with this shift so far, and while I’ll always collect the Pacers, I won’t have to look back in 10 years and try to remember how I ended up with so many cards of Ike Diogu or Shawne Williams. Plus, I’ll still have these guys covered in my All-Time Pacers autograph collection. With all that said, I’ve picked up some recent Duncan inserts to add to the collection. Pretty excited about the Star Power Plus in particular.